Ridemakerz is a beautiful shopping spot for toy car enthusiasts who want to create their dream ride. The business was started by Larry Andreini and Maxine Clark as an American retailer of customizable toy cars. The two opened the first location in June 1, 2007 in Myrtle Beach, SC. The company had opened twelve locations in ten other states but began closing most of their stores in late 2009. By the end of the 2009, Ridemakerz have four remaining stores in Myrtle Beach, SC, Downtown Disney Walt Disney World, Downtown Disneyland, and in Branson, Missouri. In 2008, Ridemakerz won “Best Attraction Retailing’’ for stores under 5,000 square feet in Chain Store Age Magazine’s Retail Store of the Year awards. At Ridemakerz toy store, you can actually build toy cars and trucks where you can choose from bodies such as Ford Mustang, Chevy Corvettes and Camaros, Dodge Viper, and more. You can also customize the toy car you want to build with interchangeable accessories. At Ridemakerz store, you can use your ingenuity into car-customizing experience where you can motorize, mobilize, customize and sonicize one of a kind toy car. Between the body styles and colors, lights and sounds, accessories, treads and wheels, there are millions of possible combinations not including individual decal placement. To make the story short, Ridemakerz is about the fun and excitement of creating something great, artistic, something original, and unique in style and creativity. Since its establishment in 2007, Ridemakerz has been committed to help kids and adult alike in creating customizable toy cars. Driven by a passion for having fun with real-world car culture, Ridemakerz gives inspiration to everyone who has self-interest in creating one-of-a-kind toy cars. The fun of customizing quality toy car in a unique and artistic way has won praises from kids, parents, industry leaders, and car enthusiasts. The creations of customizable toy cars by car enthusiasts at Ridemakerz unleash creativity, encourage enthusiasm, foster confidence, and instill a sense of collaboration. Customizing a toy car provides almost unlimited choice in body style, tires, rims, spoilers, and much more. It’s the reason why each creation is made in a unique style with originality that reflects each individual’s personality. The founders of Ridemakerz believe that everyone is born creative and enthusiastic. They seek car enthusiasts with natural creative talent by providing them a vast palette of beautifully designed high-quality parts and accessories where they can express their unique vision of their fantasy vehicle. The customizable toy car creation at Ridemakerz is described as a do-it-yourself-together experience. Knowing that they created their customized toy cars, they also realize that they could not have done it without the assistance and support of others. The experience of working together with other customers, brings a sense of good collaboration in developing interest of any car enthusiast. 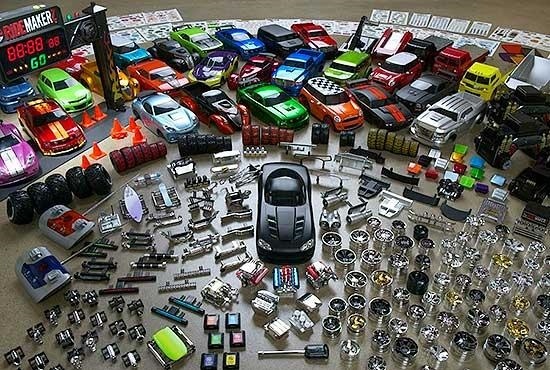 If you want to achieve your dream ride in real life, go shopping at Ridemakerz where you can create your own customized toy cars without the need of mechanical skills.